Like most wild game, elk is a lean meat that is high in protein. Wild elk don't have time to sit and graze on the land like cattle, resulting in a healthy alternative to beef smoked recipes that has about 1/6th the amount of fat and an equal amount of protein. Due to this low fat content, it takes a few extra precautions in order to avoid drying elk meat out over the long cooking process on a smoker. This smoked elk recipe uses some unique cooking tips such as wrapping it in bacon, injecting it with broth, using a water pan, and coating it with a glaze. 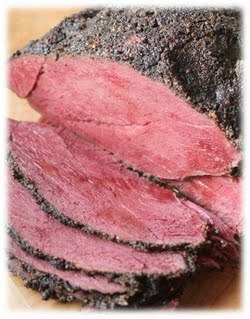 Follow the recipe instructions below to produce a tender and moist smoked elk roast. Make sure your bacon and elk roast are completely thawed out. Fire up your smoker to a temperature of 225 degrees. If you have a charcoal smoker, make sure you allow yourself about 30 minutes for the charcoal to turn a white glowing ashy color. Fill your water pan with beer or water. If your smoker doesn't have a built in water pan, you can always add a cast iron pan near the heat source of your smoker so it will boil and add moisture throughout the cooking process. Inject the elk roast with the can of beef broth in numerous places throughout the roast using a meat injector. You will most likely only use half of the can. Mix your Cajun seasoning, black pepper, salt, minced garlic, and onion flakes all together in a mixing bowl. Then, drizzle olive oil on the seasoning mixture until it becomes a working rub paste. Spoon the rub paste all over the elk roast and rub it in with your hands to evenly spread it around the entire outside of the roast to form a glaze. Wrap the elk roast completely with bacon and secure it in place with toothpicks. As the bacon cooks, it will melt the fat directly down onto the elk in order to keep it moist and tender. Place in smoker at 225 degrees and cook until an internal temperature of 150 degrees for a medium-rare result. Your elk roast should take about 4 hours or about an hour per pound. It is important to understand that elk has a tendency to quickly dry out on the grill. The smoking time will take about 4-5 hours or about an hour for each pound of meat. The easiest way to monitor your elk roast throughout the cooking process is to use a wireless meat thermometer. Wireless meat thermometers are a grill master's best friend because it allows you to constantly check the temperature without lifting the lid of your smoker and letting all the heat and smoke out.